 Join the Congressional District-State Legislative District Group; see below.  Join us in an upcoming face-to-face CDSLD Data Analytics Session.  Join us in an upcoming CDSLD Data Analytics Web Session. .. every Thursday at 7:00 p.m.
 Use the CDSLD GIS Project .. about GIS. The Congressional District-State Legislative District (CDSLD) Group is a forum intended for individuals interested in accessing and using geodemographic data and analytical tools relating to voting districts, congressional districts & state legislative districts. Join the CDSLD Group to receive updates on these topics, data analytics and access to GIS-related resources. .. there is no cost. The interactive table shown below includes one row for each VA state legislative district. Click link in District column to view maps and drill down data to block group level. .. presently active for H011,H044,H045,H053,S036. - click District Type selector below table and choose H; table refreshes.  Select one district by district ID/code. - click FindDist button; table refreshes with rows where text entered matches District column.  Select one district by incumbent name. - click FindName button; table refreshes with rows where text entered matches FullName column. - click a column sets button below table; table refreshes showing only selected columns.  Select a combination of Chamber & Party. - key in H or S in Chamber & Party left edit box. - key in D or R in Chamber & Party right edit box. - tables refreshes with SLDs meeting those criteria.  Export a set of district rows. - click checkbox on each district to be selected (row turns blue). - right click blue area to copy to clipboard; paste in spreadsheet then transpose..
- click Chamber & Party button, selecting on H-D rows .. table refreshes. - click Econ Cols button .. table refreshes. - click on Median Household Income column header cell, sorting in descending order. - view now appears as shown below. .. click $MHI header cell again to see that H071 has the lowest $MHI for this set of districts. - scroll down the rows to find the rank (left column) of a district of interest. - to view a specific district by code, use the FindDist button (See above). - to view a specific district by incumbent name, use the FindName button (see above). As noted elsewhere, data in the table are sourced from the American Community Survey 2016 5 year estimates (ACS1216). These data are based on a sample of respondents to a 5-year survey spanning calendars years 2012 through 2016. The estimates are centric to 2014. These are the most recent data available as of December 2017 and will update with ACS 1317 estimates in December 2018. These data are estimates and subject to errors of estimation and other sources of error. That said, we have used these data over a very long period for wide-ranging geographic levels and find the estimates to be very good and accurate depictions of actual circumstances. Note that for areas 65,000 population and over, ACS 2016 1-year estimates (ACS2016) are available. The 1-year estimates provide a more current estimate and generally more accurate. The 1-year estimates are not available for SLDs but are available for states, larger metros and counties and all 115th CDs. For example, the ACS 2016 1-year total population estimate for Virginia is 8,411,808 (centric to 2016) whereas the ACS 2016 5-year total population estimate is 8,310,301 (centric to 2014 and vintage to use when comparing state to SLDs). Use these API calls via browser to access the above data. The ACS 2016 1-year $MHI estimate for Virginia is $68,114 (centric to 2016) whereas the ACS 2016 5-year $MHI estimate is $66,149 (centric to 2014 and vintage to use when comparing state to SLDs). .. prepared for individual CDs/SLDs. .. access this profile as an XLS file developed from table above. All 50 states, and D.C. and Puerto Rico, participated in Phase 4 of the Census Bureau Redistricting Program, as part of P.L. 94-171. All states and areas provided the Census Bureau with the 2016 election cycle boundaries, codes, and in some cases names for their state legislative districts. States provided updates for their boundaries used in the November 2016 elections for the session that began in January 2016. 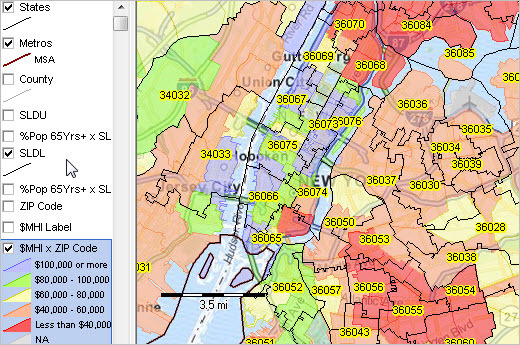 The Census Bureau develops standardized SLDU and SLDL shapefiles. The following states had changes to their state legislative districts for 2016: Florida (upper house only), Minnesota, Maryland (lower house only), Georgia (lower house only). As of 2016, the 6,558 state legislative districts in the U.S. are comprised of 4,629 lower/house chambers and 1,929 upper/senate chambers. Of the total state legislative districts, 1,257 are 100-percent urban (every census block comprising the district is urban), 19 are 100-percent rural, and 927 are less than 1-percent urban. Use the interactive table in this section to view, rank, compare state legislative districts by rural and urban population and geographic area. Use GIS tools to visually examine U.S. or state by state legislative district patterns such as percent population urban. 2016 State Legislative District (SLD) boundaries used here are based on the TIGER/Line shapefiles. The following frames a dynamic presentation using the CDSLD VA GIS Project. - where there activity, what seems to be working, where planned activity is located.